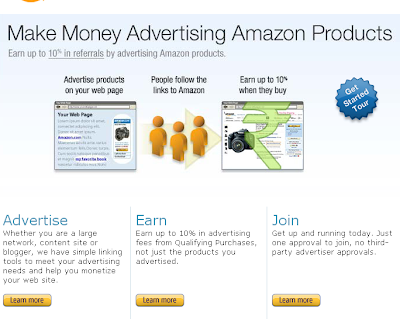 Amazon India opens up Affiliate program for webmasters | NewbieTechTips! Amazon, one of the largest online shop and market place opens up dedicated affiliate program for webmasters in India. Few months back Amazon started dedicated Indian version amazon.in, and now Indian webmasters can opt for Indian Affiliate program on amazon.in. For beginners, affiliate program is a program by which bloggers and webmasters can display products of Amazon on their website, the banner or link contains the unique affiliate Id of the blogger. When the blog/site visitors click on such affiliate banners and make a purchase on amazon, the Amazon Associate (Name of Amazon Affiliate program) earns a percent of total purchase by that visitor. Affiliate program is different from conventional advertising, where the income is generated not by number of clicks or views but by eligible sale. In my views a balance of PPC/PPM and affiliate banners are also a good source of income for webmasters. To get started, visit affiliate-program.amazon.in and create a account. If you already have a amazon account then sign-in with your existing Amazon account. Fill in the form. Amazon manually approve your site within 24 hours, but you will get full access to affiliate dashboard as soon as you sign up. You can easily build affiliated HTML links from your Links & Banner dashboard. 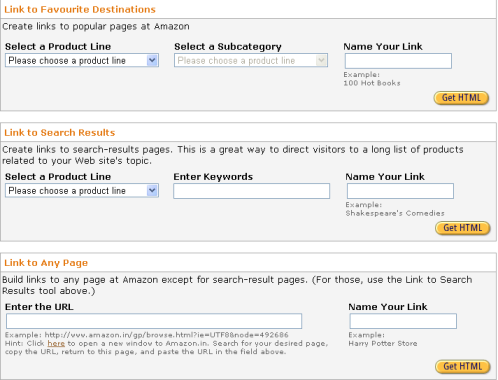 There is also a option where you can convert any link of amazon product into your affiliate link. Another great NEWS for Indian bloggers is that after the launch of Amazon Affiliate program, the competitors like Flipkart increased the affiliate commission on books from 6% to 10%. Images screenshots of amazon.in affiliate dashboard.